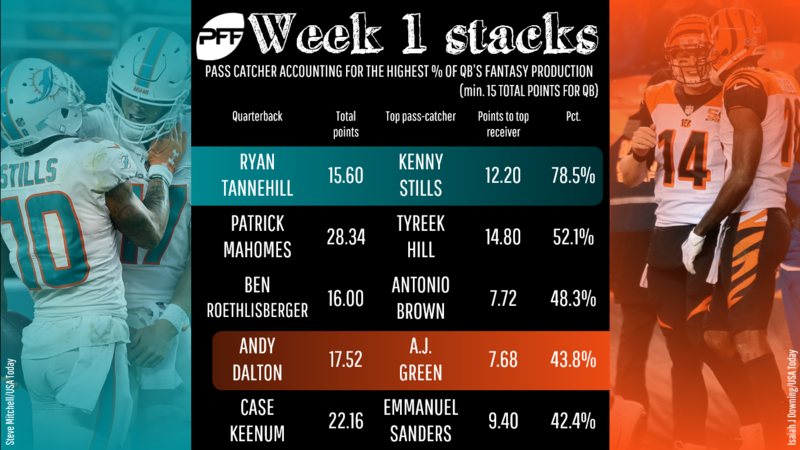 With the second-highest over/under this week at the dome in New Orleans, the Browns stack has a chance to smash if the game script dictates it against a pass defense that allowed the most fantasy points in Week 1 — to Ryan Fitzpatrick, no less. The Browns claimed Gordon would rotate in, but he started and played most of the snaps. Gordon is a touchdown threat every game and based on his (and Taylor’s) history on deep passes, a big game is coming. Landry is playing the Antonio Brown role in Todd Haley’s offense with 15 targets and over 100 yards last week.